I remember hearing that people were so obsessed with Tetris in the 80’s that when they’d close their eyes they’d still see the pieces falling and fitting together in their mind. It’s called the Tetris Effect, and I’ve always thought it was weird that people considered it strange enough to warrant its own name. Pretty much anything I get super into will start to invade my thoughts and dreams when I close my eyes. Isn’t that pretty normal? Why is Tetris special? Certainly there are plenty of iOS games that give me the same “effect” when I play them long enough. Like Swapperoo ($1.99), for instance. Swapperoo is a new game that has definitely been giving me what I’d call a “Match Three” effect, in that I have a weirdly strong urge to shift imaginary shapes around and clear matches even when I’m not playing the game. Of course, this probably wouldn’t be happening if the game was terrible, and indeed it’s not. In fact, it’s easily one of the best and most inventive puzzle games I’ve played in quite some time. It’s set up like a fairly typical match-three game where you’re presented with a board of differently colored tiles, and your duty as a citizen of the planet Earth is to slide them into matches of three or more so they’ll disappear. It also uses the objective-based goals that the Candy Crush (Free) series popularized, like “clear such-and-such numbers of so-and-so’s” to pass each level. Almost everything else about the game, though, is quite different. For example, you don’t swipe tiles to make matches like in Candy Crush. You don’t slide rows like in You Must Build A Boat ($2.99). You don’t drag pieces around like in Puzzle & Dragons (Free). 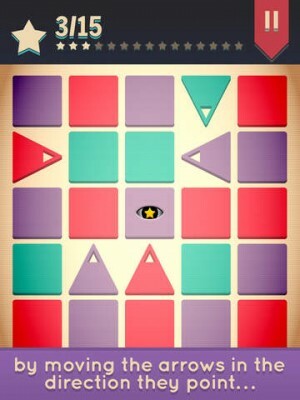 In Swapperoo, each tile has a certain shape that can only move in certain ways. Tapping an arrow piece, for example, shifts that piece in whatever direction it’s facing. Tapping a circle will pop it like a bubble, causing the pieces above to fall down one space. Squares can’t be moved at all (by you, anyway). Those are the basics, but there are variations on each shape as well. There are drill arrows that destroy–rather than swap with–the piece they face, and certain squares are completely fixed in place and can’t be moved at all. There are grey pieces that won’t match with anything, spiral portals, and several other pieces that behave in unique ways. On top of all that, there are also special “eye” tiles that have further unique properties. Skull Eyes, for example, will blow up and end the game if you don’t clear them within a certain number of moves. Star Eye tiles are usually part of an objective and a certain number of them need to be cleared to pass a level. Finally, Heart Eye tiles must be protected at all costs and Big Eye tiles will hunt them down and end your game if too many are destroyed. Actually, there are even more pieces than all those, like padlock pieces that need to be “unlocked” before they can be cleared, but I’ll stop there. You get the idea. If any of that sounds overly complicated, rest assured the game introduces all of these elements gently and it never feels overwhelming. That doesn’t mean the game is easy, though. It can be incredibly tough the further you progress, but it always feels fair. It’s definitely a bit slower and more strategic than most match three games, and I kept having to remind myself to think ahead and take my time when my instinct is usually to make easy matches as fast as possible. (I had YMBAB in heavy rotation before this.) I can’t tell you how satisfying it is to fail a level twice, and then force myself to slow down and be smarter and finally pass it on the third attempt. Setting gameplay aside, the rest of the package is pretty outstanding as well. The visuals remind me of a lighter Puzzlejuice ($1.99), with a flat, squared look that conveys everything in a simple and sleek way with no fuss. The music and sound effects also do a great job of setting the mood without distracting from the brilliant puzzling. There also seems to be a hint of a story weaved between some levels, with mysterious text appearing every so often. The game has two main modes, Regular (I’m calling it that) and Challenge. Regular is split into normal difficulty and hard difficulty, and Challenge spans three pages of levels and is even more puzzle-y than the regular mode. There you’ll be given a few pieces that need to be cleared in a limited number of moves, and most of the levels seem to require a very specific solution to solve them. It’s a clever way to build on the core mechanics of the game, and I can see some people having even more fun there. Most of us are pretty sick of match three games at this point, and it’s safe to say it takes something pretty special to squeeze a glowing review out of the genre these days. 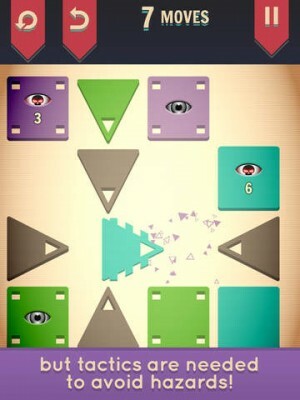 Swapperoo by Fallen Tree Games is one such game. It’s incredibly clever, deeply strategic, has an inviting visual style that begs to be interacted with, and is just plain fun. If you’re one of the people I often see in our forums asking for “premium” match three games with no free-to-play shenanigans, welcome to your next addiction.